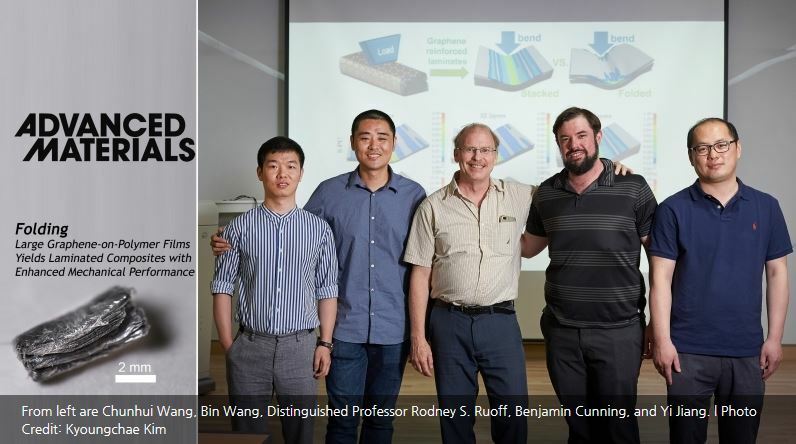 This breakthrough has been led by Distinguished Professor Rodney S. Ruoff and his research group from the Center for Multidimensional Carbon Materials (CMCM), within the Institute for Basic Science (IBS) at UNIST. Professor Nicola Pugno from University of Trento in Italy, and Professor Seunghwa Ryu and Dr. Stefano Signetti from KAIST, provided theory and modeling that complemented the experimental results from Professor Ruoff’s group. “Professor Ruoff and I decided to try folding graphene, with a thin polymer layer attached to it, so that we could also try to achieve 12 folds but from a much smaller starting sheet of material,” says Dr. Bin Wang, an IBS Research Fellow and the first author of the study. Using a water-air interface, Dr. Wang first folded an A5-sized, 400-nanometer thick polycarbonate film in half 12 times, yielding a millimeter-thick bulk material—an interesting accomplishment onto itself. He then ‘filled’ large area monolayer graphene film into the folded laminate by starting with an A5-sized 400-nanometer thick polycarbonate film but now coated with a single layer of A5-sized graphene that had been grown by chemical vapor deposition by Professor Haofei Shi and colleagues from Chongqing Institute of Green and Intelligent Technology in China. Larger length x width (that would also be thinner) samples of the final folded sample were needed for mechanical testing. 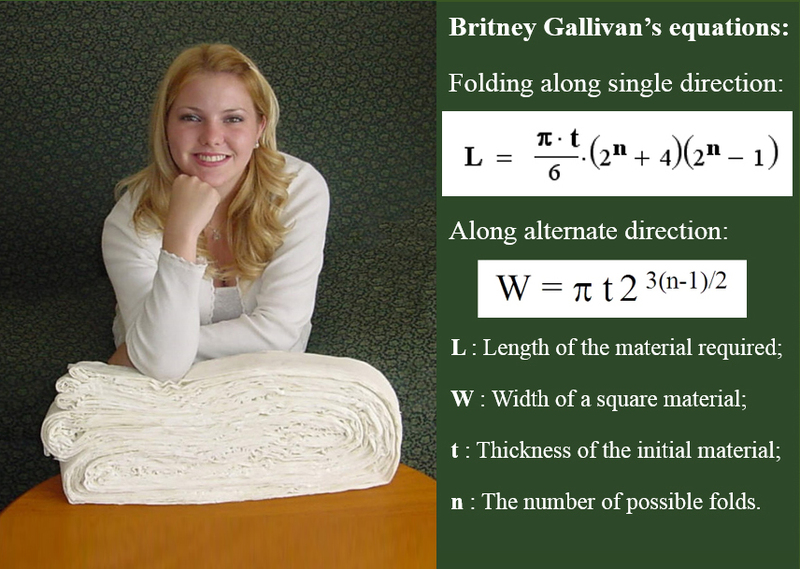 Wang thus made a series of samples each with 10 folds (rather than 12), and used a ‘three-point bending test’ to study their mechanical response. 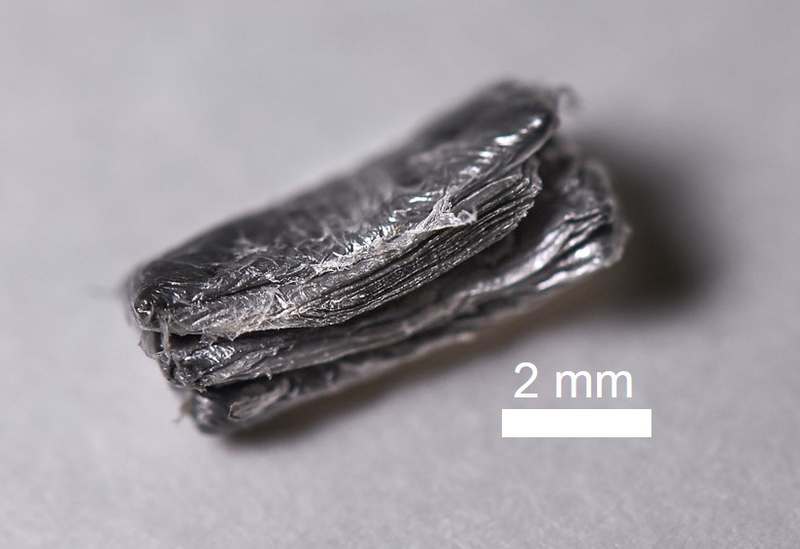 With a remarkably low volume fraction of graphene of only 0.085% (less than 1 part in 1000), the Young’s modulus (intrinsic stiffness), strength (stress that the material breaks at), and toughness modulus (energy consumed in breaking the sample) were enhanced in the folded composite by an average of 73.5%, 73.2%, and 59.1%, respectively. From the graphene folds alone the Young’s modulus was increased by 24.2%, strength by 25.4%, and toughness modulus by 14.5%. Note that these values are lower bounds, from the team’s modeling. Thus a remarkable mechanical reinforcement from the combined folding and stacking of graphene was found. Professor Ryu and Dr. Stefano Signetti from KAIST who provided the theory used finite element modeling (FEM) to simulate the bending of the folded laminates and discovered that the folded configuration provides much higher bending stiffness with respect to the stacked configuration with the equivalent 1024 layers of embedded graphene. “The additional constraint given by the folds results in both higher specific deformation energy stored in the composite plate, and also higher bending force at the same imposed displacement as compared with the plate with the same number of stacked layers but without the folds,” says Dr. Signetti, a postdoctoral fellow from KAIST. This research was supported by the Institute for Basic Science and has been published online in the journal Advanced Materials on July 11, 2018. Bin Wang, et al., “Folding Large Graphene-on-Polymer Films Yields Laminated Composites with Enhanced Mechanical Performance,” Advanced Materials, (2018).